Note that the results could be bug ridden. I just want showcase how deploying capital is important for potential max return. This is all driven by the analysis in order to get these type of returns. The scripts that generate this data are still under development. This entry was posted in Forex, Quant Analytics, Quant Development and tagged asset class, Capital, daily, deploy, how to, market, max return, selection, Show, stock on March 9, 2018 by caustic. 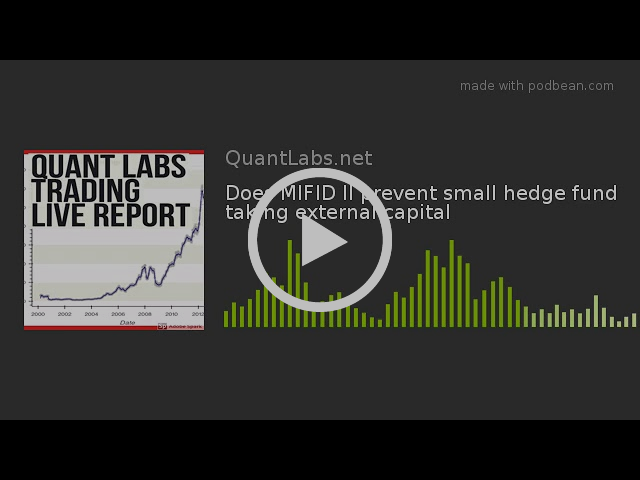 MIFID II prevenst small hedge fund taking external capital? Welcome << Test First Name >> to the New Year in 2018! Very interesting legal development. One guy from a European bank’s ER said that the ER departments in many institutions are going to shut down, because they don’t expect the clients will pay for their sell-side research. We are witnessing a huge reshape of the current S&T business model at sell-side financial firms. This entry was posted in Hedge Fund and tagged Capital, hedge fund, MiFID II, prevenst on December 29, 2017 by caustic. This entry was posted in Quant Opinion, Trading and tagged Capital, hedge fund, Manager, MiFID II, prevent, Small on December 28, 2017 by caustic. When we increase our return on capital for a trade, we usually reduce our probability of profit. Tune in to learn about this common tradeoff! Trading can be a full time job, but it doesn’t have to be! Tune in to see how Mike Butler trades around his job with efficiency! This entry was posted in Trading and tagged Capital, probability, profit, return on March 23, 2017 by caustic. Has machine learning failed the hedge fund industry? When you read the article listed below, one wonders if this automated technique actually works for the capital markets. As you will learn, one person said there was a failure rate as high as 65% but the remaining 35% was very good. If you ask me while being a newbie at implementing this, I would think the odds of true success are much much lower. As I always thought, this will always be put on the back burner. This entry was posted in Quant Development and tagged Capital, learn, Machine Learning, markets on November 12, 2016 by caustic. This entry was posted in Stock News and Tips and tagged Capital, oil on August 18, 2016 by caustic. This entry was posted in Stock News and Tips and tagged brexit, Capital on July 29, 2016 by caustic. This entry was posted in Stock News and Tips and tagged Capital, oil on June 26, 2016 by caustic. This entry was posted in Stock News and Tips and tagged Capital, ETF, income on May 31, 2016 by caustic.